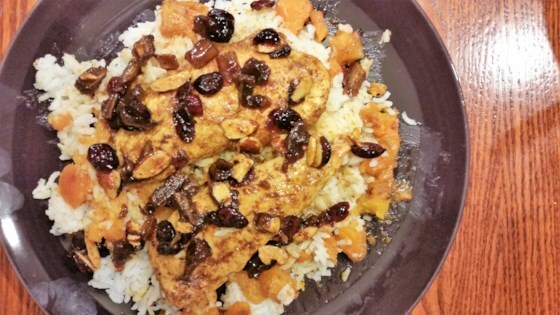 "Delicious Moroccan-inspired chicken dish served with butternut squash noodles." Place spiralized butternut squash in a bowl; add 1 tablespoon oil, salt, and pepper. Toss to coat and transfer to a baking sheet. Bake in the preheated oven until just tender, 7 to 10 minutes. Heat butter and remaining 2 tablespoons oil in a large saute pan over medium-high heat. Add chicken and sprinkle both sides with Moroccan spice, salt, and pepper to taste. Cover pan and cook, turning occasionally, until chicken is no longer pink in the center and the juices run clear, 5 to 7 minutes. Remove chicken and set aside. Add orange juice, apricots, cranberries, and dates to the same saute pan over medium heat. Cook and stir until orange juice thickens, 3 to 4 minutes. Add almonds and toss to coat. Remove topping from heat. Plate each portion with butternut squash, cooked rice, chicken, and topping. Spaghetti squash goes weeknight Italian! If you don't have a spiralizer, you can roast the squash and cut it into cubes instead.